I originally signed myself up to ride the 50 on Tanna and my niece, Lillie, to ride the 50 with me on Sasha. 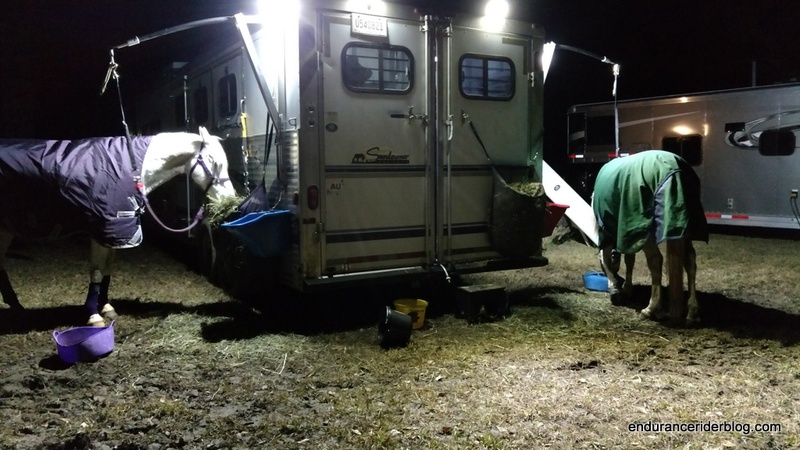 Unfortunately, Tanna got an abscess the week before the ride and knocked him out. Without another horse for me to sponsor her on, Lillie was unable to ride. Daniel and I loaded up Sasha and Tanna on Wednesday about 9 AM and headed down to south GA for the Camp Osborn Boy Scout Pow Wow. I brought Tanna along to keep an eye on his foot. He'd popped the abscess, but still needed some care for it. We had hoped to be in camp well before dark, but the traffic slowed us down by a good bit and it was after dark when we arrived. We drove into some good rain and radar showed it had been raining at ride camp a good amount (yellow and red) for a good long time before we got there. We pulled straight off the driveway and pulled in far enough to safely put the horses out on the high ties. Put out hay, water, walked the dogs and the horses and then went to bed early. It rained and rained overnight, pouring more and more water on saturated and flooded ground. On Thursday, I was scheduled for a run, a long run. As long a run as I could manage. But due to the weather, the saturated ground and the fact that I didn't want to run dirt/sand roads for miles on end, I wimped out. We tried to get the trailer turned around to park a bit better, but unfortunately, got stuck. Daniel immediately stopped and we waited for the TRACTOR to come pull us out. This was not a tiny little putzy tractor, but a nice, big, yummy, John Deere Green Tractor! I was in complete awe watching that thing so I forgot to video it pulling us out as I just watched. Once the trailer got parked, Daniel and I stomped down as much of the ruts as we could. Then I went back to the trailer, putting things right and getting my vet check stuff together and over to where we would vet check. When Joe got there, we had a place all ready for him to park next to us. 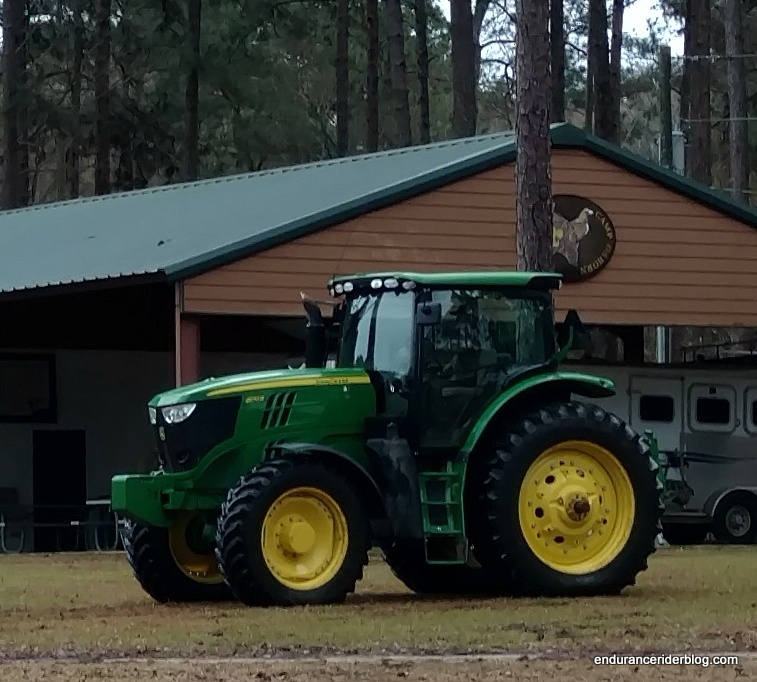 He unloaded Kit and Friday and I hand-grazed them while he and Daniel got Joe's new, shiny rig parked, set up and an electric pen set up for the horses. Both horses were very well behaved, but I insisted no rolling. I didn't want to try to handle both of them rolling at the same time in hand. I can handle my two rolling in hand at the same time, but didn't want to try it with Joe's horses. Next was registration in a nice warm office. I made sure Kim had changed my horse registration to Sasha and got my ride card. Registration. Kim teaching the next generation of ride management! At vet in, I left Tanna at the trailer and took Sasha up to vet. Boy, what a pain she was! Spinning and hollering for Tanna and dancing around like she had ants all over. I apologized to the vet and was a bit embarrassed, especially when Sasha went into a buck and a canter during the trot out. I backed her several feet until she gave in and trotted the rest of the way. She still vetted in with a 48 pulse. For as idiotic as she was being, I would have thought much higher! 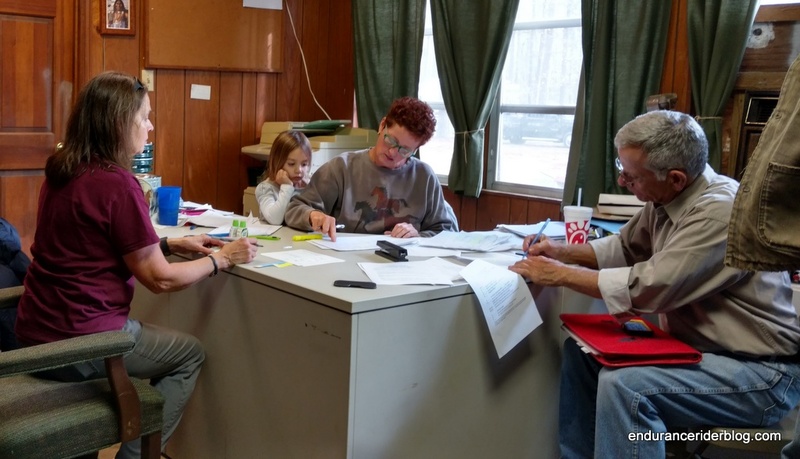 Ride meeting was held in the Boy Scouts' dining hall. It was much nicer in there without the cold wind! 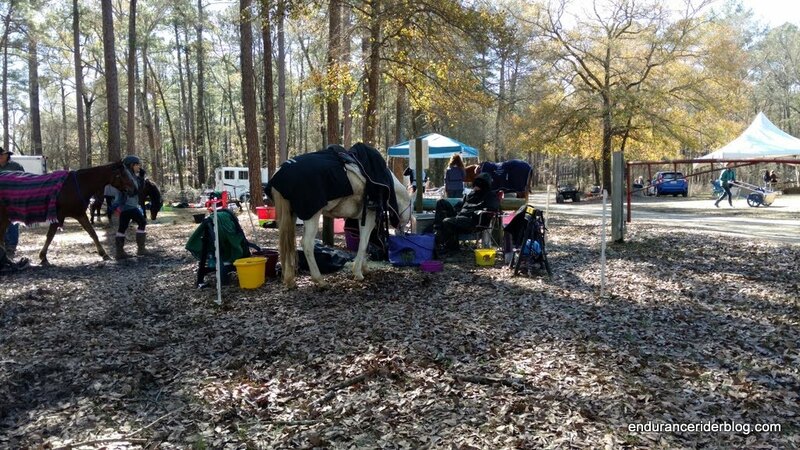 50s would do a 3.5 mile trail loop, an 11ish mile road loop, then do a trot by near camp and back out for a 12.5 mile loop before returning to camp for a 60 minute hold. Next was a repeat of the 12.5 mile loop and another 60 minute hold. Last loop was a repeat of the 11ish mile loop. Start at 7:30 AM for all riders. Around 63 total starters between the 25-mile and 50-mile distances. Up at 5:30, I gave the horses their breakfast and crawled back in bed for 30 minutes to slowly wake up. Up for good at 6 AM, I got dressed and Daniel made grits for breakfast. 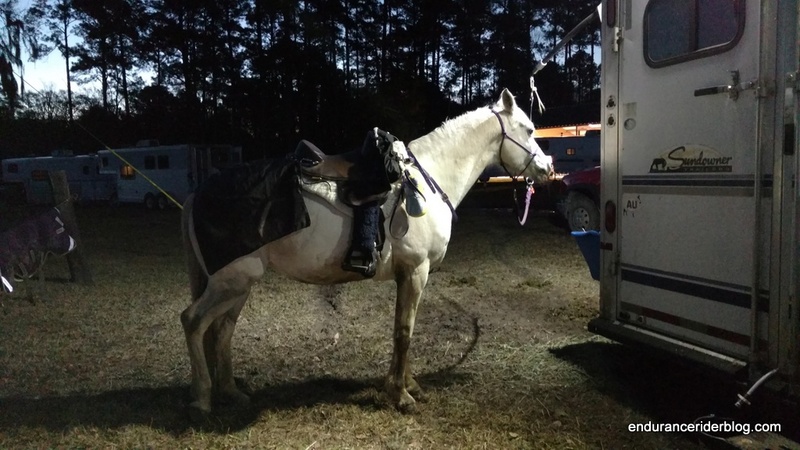 Sasha was all saddled at 7 AM and ready to go with a big number 13 marked on her hindquarters. 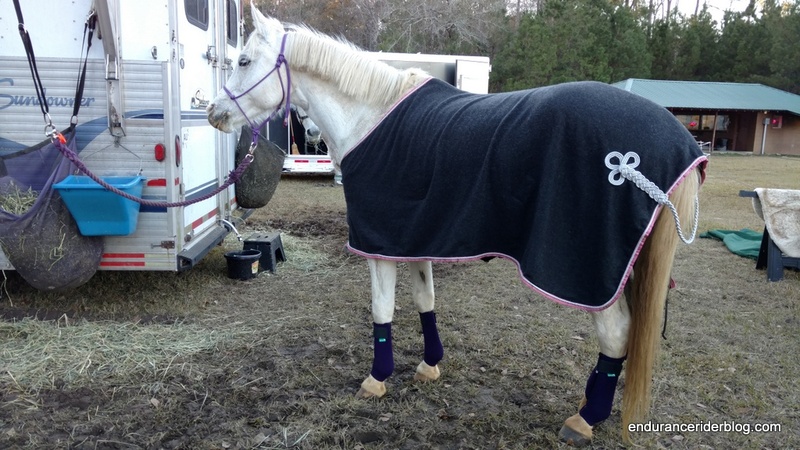 Lucky 13 for the 13-year-old mare on her first competition of 2016. Poor Tanna kept expecting to be saddled, but nope, not this time, buddy. This was the potentially confusing loop. Blue, blue, blue! The only trail we would be able to use was a 3.5 section of the trail marked in blue. Ride management spent a lot of time and energy on Thursday rerouting the trail to keep us off the worst of the muddy bogs and horse swallowing puddles. This meant we were routed mostly on dirt roads, but we were able to get a look at some of the trail first thing. I teamed up with my buddy, Joe, who was riding his gelding, Friday, in the 25 mile ride. 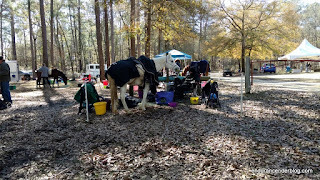 I was riding the 50, but since we started at the same time and were doing the same trail, we decided to start together and see how things went, agreeing to split off if the horses weren't meshing. After Sasha's spirited display at the vet in the day before, I was perfectly happy to start slow and near the back of the pack. Joe hand-walked Friday for a little bit and then got on. Both horses spun and danced as we were passed by a pack of riders. Then we started to move on down the trail and got into the single track. I offered to lead if needed, but either way, Sasha was fine. Joe decided to lead. We wound through the trail, popped out beside the road, then back into the trail and into a big, deep puddle. Sasha was still being a jumpy thing and I kept my feet solidly under me to keep my seat, but that resulted in a bit of wet feet. If I had been on Tanna, I would have been wetter since he's a bit shorter. That freaked me out a bit, but we got through it without incident and moved on. Sasha does NOT like to be crowded. She used to be very protective of her rear end. She still can be, but is much better these days. Even so, she got fed up with the entire situation and threw out a double-barreled warning shot that did not connect with the horse behind her, but threw me completely out of the saddle and elicited a shriek from me. 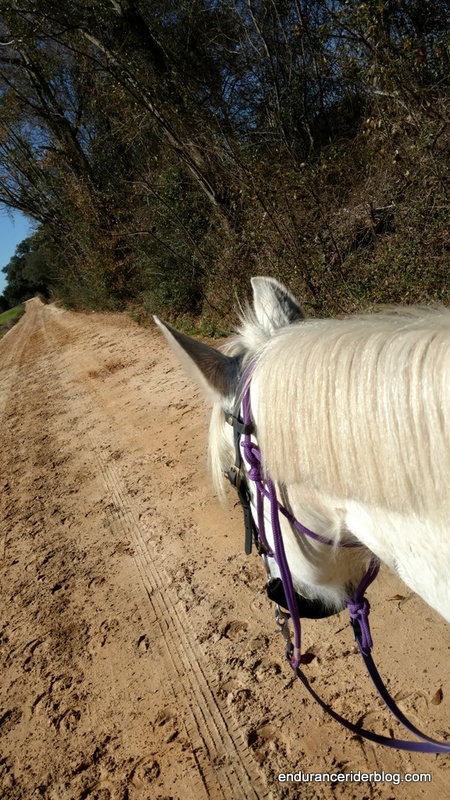 Fortunately, I plopped right back down in the saddle, slid my feet into the stirrups and we went on. I intercepted at least 3 more attempts to double-barrel kick over the next mile or two. 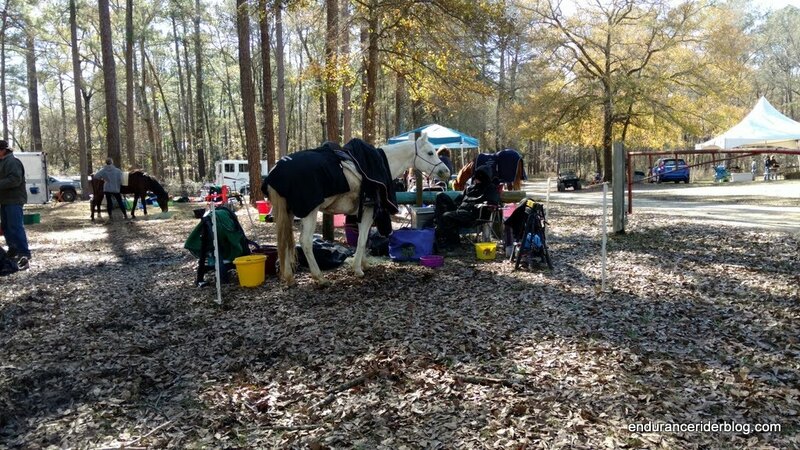 When we finished the trail loop and moved out to the road loop, I moved Sasha to where there was nobody behind her and slowed her so the other horses moved past her and got her out of the group. I did not want her to get another kick past me and possibly connect. I slowed her to a jig until the group got well ahead and then asked her to do a mild 8 mph trot. She shook her head a bit, but settled into it and seemed much more content, even though Friday had moved on with the group ahead. After another mile or so, Joe and Friday had pulled off and waited for us to join them and we continued down the trail, the four of us. I had a great time riding with Joe and chatting with him. Jessica Willis of Unbridled Imagery got a great shot of us having fun. 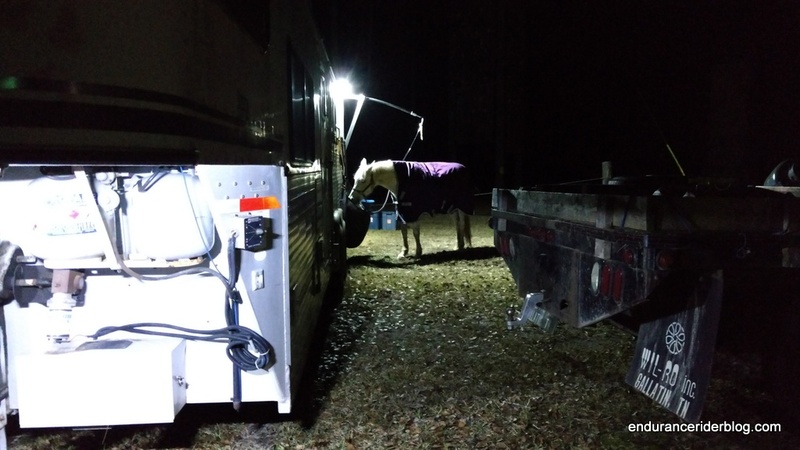 When we finished that road loop, Joe and Friday headed into camp for their vet check and Sasha and I turned around and headed back out on another road loop. Sasha was happy enough for awhile, but about 5 miles out, she just slowed and slowed and then stopped. I sat quietly on her while she stood there looking around and trying to figure things out. After a minute or two, she continued on (because I wouldn't let her turn around) at a good trot. At one point, we passed a farm with several horses and Sasha called and called and called. Poor girl. Next up was my favorite part of the ride. We went across some water onto a levee that wound around. That was a lot of fun for some reason! When we came out of that field, Sasha was excited. We were only a street up from where we had entered the road loop and she felt we were headed back. We were, but had a little extra to do. We did that loop in 3 1/2 hours. A good enough time, but I normally would have gone slower. Usually, I have 12 hours, minus holds, to do a 50, but since this was Friday, and the Sabbath would start at sunset, I had to be back in camp no later than 5:30 to be able to vet in and clean up our vet area by sunset. That gave me 10 hours, minus the 2 hour holds, minus an hour for a buffer, gave me a plan of 7 hours to get the 50 done. A little better than 7 mph average I had to keep. So far, so good. Sasha eating and supervising at the vet check. It was chilly, so kept her covered when not moving. Sasha vetted in fine with an admonition to get her eating since her guts were a B. Long loops without much grazing will do that. She did great on drinking though. Back at our vet area, she didn't want to eat her beet pulp, but ate her alfalfa hay readily enough. I left her in Daniel's capable hands and headed to the trailer to grab something to eat and check on Tanna. I'm very used to 40 minute holds, so I was a little at a loss what to do for the extra 20 minutes. Sasha ate about the same amount of time as she would for a 40 minute hold and then decided to nap. 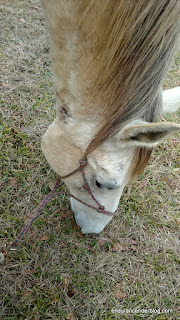 I gave her electrolytes (since she didn't eat them in her beet pulp) and she ate for the last 5 minutes of the hold. I went out at my out time. With 60 minute holds, not hard to do. This next loop was a repeat of the last 12.5 miles of the 1st loop, so we both already knew where we were. Sasha was a little less forward on this loop, but moved out at a decent trot. I asked her to canter a few times to break it up as well as mixing in the walk and trot. She did not slow to a stop on this loop, but actually got more forward about half way through the loop. That coincided with the end of the "30 mile blues" and getting back where she knew we were headed back to camp. We had a lot of fun doing the levee again, this time at a canter since I knew the footing was really good. She spooked hard at a bird swimming, but I managed to stay on and back into a canter we went. I spent more time getting Sasha to eat this loop. I had switched to her Little S hackamore from the kimberwicke and it took her a few tries before she realized she could take big ripping bites and not get the grass hung up in the bit. But once she got that, she was happy to grab big bites when I spotted some good grass that we could get without trespassing. Sasha drank well the entire ride. I didn't have to worry once about that. We came into camp right on schedule with a 7 mph average for the second loop. I spent a little extra time cleaning her up before getting to the vet 8 minutes after arriving. Not that she was spotless or anything, just getting some of the gunky sweat from around the saddle pad. 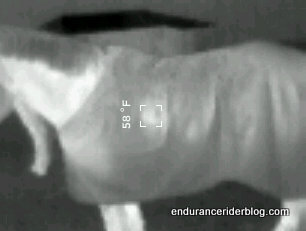 This time, I mentioned to Dr. DeeDee that Sasha was guarding when I posted her faster trot on the left front diagonal. I suspected the right hind. Dr. DeeDee agreed there was something going on there, but not consistent and not enough to keep us from going out on the last loop. During the vet check, I kept Sasha's wool cooler on her and let her eat. She was hungrier than the first vet check and ate a good amount of her beet pulp this check as well as more alfalfa. Again, I left her with Daniel and went to grab a bite to eat and change one of my socks. When I returned, Sasha was napping again. I gave her a few electrolytes which again started her eating for the last few minutes of the hold. I got to the out-timer with 20 seconds left on my hold. Last loop and the shortest loop. I like short last loops. Sasha was not thrilled to be going out again on the same dirt road we had used several times already to get to the loop that repeated part of what we did on the first loop. She repeatedly tried to turn around for the first mile or so, but finally settled down and moved on, but without too much enthusiasm. I pulled out my phone and downloaded several of my running songs from Google Drive, plopped them into a playlist and set the playlist to play through my speakers. I'd forgotten my mp3 player and didn't have headphones anyway, so I decided maybe she'd like to hear the songs. Amazingly, it worked, she perked up right away. I tucked my phone back into the Spibelt with the speakers facing out and positioned it on the front of my hip bone so she could hear. I sang along in my horribly off-key, but happy voice and we rocked on. 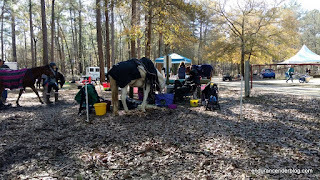 When we reached the water stop 3 miles out, we had riders coming back for their finish and I quickly turned the volume way down so as not to bother them, then let Sasha drink and graze while we chatted before going our separate ways. Volume back up and away we went. We passed a couple riders (volume down when near them) and then a song came on that really revved Sasha's motor and before I knew it, I was crouched over her neck, talking in her ear and we were galloping along having a good old time. So much fun!!! It only lasted about 2 minutes or so before I pulled her back to a trot and then to a stop to enjoy some grass, but it was a lot of fun for both of us. I think sometimes I make riding too serious and we don't have enough fun. I was a little worried I'd done a bad thing by letting her gallop (and encouraging her along), but her heart rate was normal and she trotted off just fine after eating for a few minutes. We finished the loop with a nice canter to give Nancy a little bit of a show at the finish line. 20th place. All over but the trot-out. Sasha wanted to trot back, but I insisted on a walk. No point in tempting fate as we had plenty of time before sunset now. I stayed mounted until we crossed the road, then I hopped off and hand-walked her in. She was walking at 63 before we got back to our vet area. I stripped her tack while she ate and took her to vet out. Daniel was off looking for some lost horses so I had to trot her myself and didn't get the benefit of watching her trot out. She was still guarding that right hind, but again, not consistent or bad enough to keep me from getting a completion and fit to continue. Yay, Sasha! She toughed it out with me! Proud of that little girl and so happy with her. I am planning a visit to her chiropractor this week before she gets any more training rides. I really should have gotten her adjusted before the ride. As I was cleaning things up, Daniel ran a Seek Reveal thermal sensor over her and noticed 2 hot spots on her sides at about the same spot on both sides. I threw the saddle back on and we were able to see that the stirrup leather buckles were touching there. 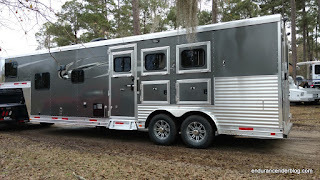 I immediately put the saddle away and went to Running Bear's trailer and bought a set of 1" biothane leathers. They're too long for me, but I'll cut them down and add more holes. Teddy would do that for me, but I didn't want to wait for them to be ordered and sent. But now the buckles won't be wide enough to hit Sasha's sides. A very nice start to the ride season. Sasha did another fairly fast (for me) 50 at around 6 hours 45 minutes (I don't have my ride card handy to do the exact math, but that's pretty close). I really would like to slow down some and do more long slow rides on her. I think I'll have my chance next month at Yellowhammer. After the ride, just before bedtime.